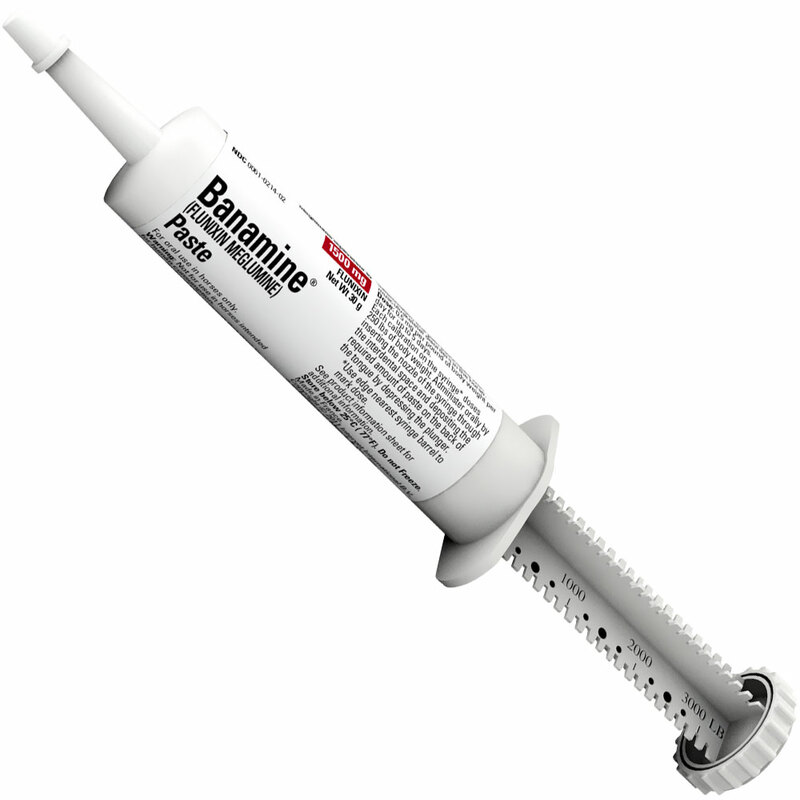 Banamine Paste is a potent non-narcotic, non-steroidal analgesic agent with anti-inflammatory and fever-reducing activity. Banamine paste is recommended for the alleviation of inflammation and pain associated with musculoskeletal disorders. 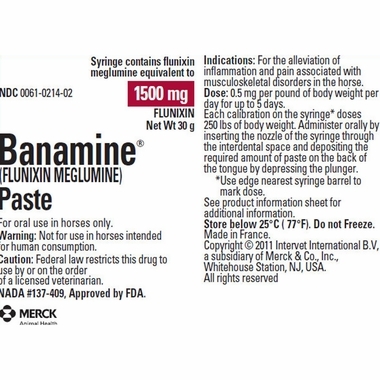 INDICATIONS BANAMINE Paste is recommended for the alleviation of inflammation and pain associated with musculoskeletal disorders in the horse. Inactive Ingredients: Starch, Corn, Propylene Glycol, Carboxymethylcellulose, Water. The recommended dose of flunixin is 0.5 mg per lb of body weight once daily. The Banamine Paste syringe, calibrated in twelve 250-lb weight increments, delivers 125 mg of flunixin for each 250 lbs (see dosage table). Once syringe will treat a 1000-lb horse once daily for 3 days, or three 1000-lb horses one time. 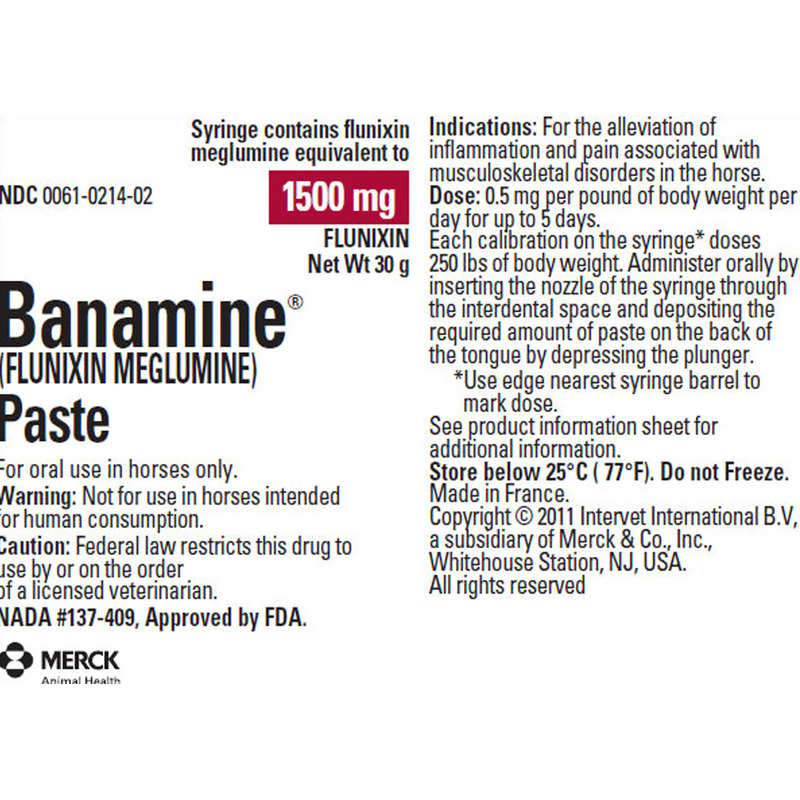 View Banamine Paste Drug Facts Sheet. *Use dial edge nearest syringe barrel to mark dose. The paste is orally administered by inserting the nozzle of the syringe through the interdental space, and depositing the required amount of paste on the back of the tongue by depressing the plunger. Treatment may be given initially by intravenous or intramuscular injection of Banamine Solution, followed by Banamine Granules of Banamine Paste on Days 2 to 5. Banamine treatment should not exceed 5 consecutive days. Precautions: The effect of Banamine Paste on pregnancy has not been determined. Studies to date show there is no detrimental effect on stallion spermatogenesis with or following the recommended dose of Banamine Paste. Side Effects: During field studies with Banamine Paste, no significant side effects were reported. Toxicity: No TOxic effects were observed in rats given oral flunixin 2 mg/kg per day for 42 days. Higher doses produced unceration of the gastrointestinal tract. The emetic dose in dogs is between 150 and 250 mg/kg. Flunixin was well tolerated in monkeys dosed daily with 4 mg/kg for 56 days. No adverse effects occurred in horses dosed orally with 1.0 or 1.5 mg/lb for fifteen consecutive days.